Where did you say you do motorcycle tours? With a history dating back to 7000BC, Oman’s heritage is rich and waiting to be experienced, from the Bedouin tribes to the illustrious maritime history that saw trade routes extend south to Zanzibar. It was one of the first countries to embrace Islam and the Omani values of tolerance, peace, humility & hospitality can be traced to this. The total area of The Sultanate of Oman is approximately 309,500 km2 and it is the third largest country in the Arabian Peninsula. Oman’s coastline extends 3,165 km from the Strait of Hormuz in the north, to the borders of the Republic of Yemen in the south and shares its coast with three seas: the Arabian Gulf, the Sea of Oman and the Arabian Sea. The country is divided into 8 administrative regions, with each region being divided into smaller ‘Wilayats’ or districts headed by a ‘Wali’ or district governor. 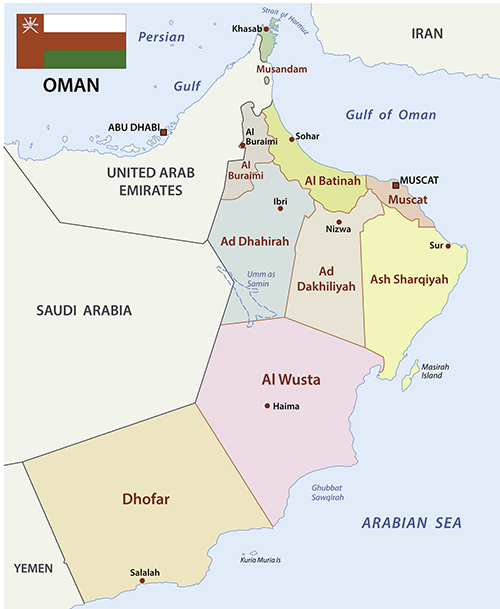 The Sultanate borders the Kingdom of Saudi Arabia in the west, the United Arab Emirates in the northeast, the Republic of Yemen in the southwest, the Strait of Hormuz in the north and the Arabian Sea in the east. The Musandam Peninsula forms the country's northern tip & is referred to as the ‘Norway of Arabia’ with it’s majestic Fjord’s. It is the only coast the Sultanate has on the Arabian Gulf and is just over 50 km south of the Islamic Republic of Iran across the Strait of Hormuz. Oman is safe, the people of Oman are quite possibly some of the finest people you will ever meet and it just so happens the riding is awesome, however please bare in mind, Oman is 80% desert, and desert doesn’t necessarily mean it’s all sand either. In reality only a very small fraction of our riding is actually on sand e.g. Wahiba Sands. Alex Chacon and the Modern Motorcycle Diaries love Oman as much as we do. Watch their video and see what Oman is all about: amazing landscapes, friendly locals and off road adventures into the remote mountains and regions. Our tours generally start in Dubai, as the best international air travel connections can be arranged through here. Not withstanding, we can also arrange tours & bike hire starting in Muscat, which is the capital of Oman. We offer different tours within Oman and try our best to accommodate all levels of riding ability. We offer self-guided tours using our motorcycles, as well as group tours, so if you and friends have something specific in mind please contact us for more ideas & help. The majority of our off road riding is manageable even for those riders not accustomed to travelling on dirt for extended distances. Dependant on the tour, most of our off road riding is on hard pack dirt tracks & roads with the exception of the Wahiba Sands and some descents into Wadi’s (Wadi’s are valleys or gullies and can range in grandeur from being similar to the Grand Canyon to dry creek beds able to be traversed on foot). If you’re not entirely comfortable there’s a good chance our support vehicle will be available to hitch a ride with. And I almost forgot...if you are interested in Iran please get in touch with us!